Select, make, and grind cutters. Surface grind blocks, pins and shapes. Cut threads, knurl parts and eliminate warp. Choose realistic feeds, speeds and depths of cut. Remove broken taps, drill bits and other hardware. Apply proven CNC techniques to maximize output. Improve surface finishes and hold tighter tolerances. Assist engineers with design and manufacturing issues. 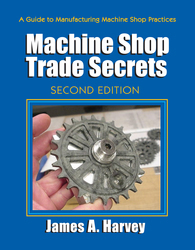 Improve indicating skills and develop a “feel” for machining.